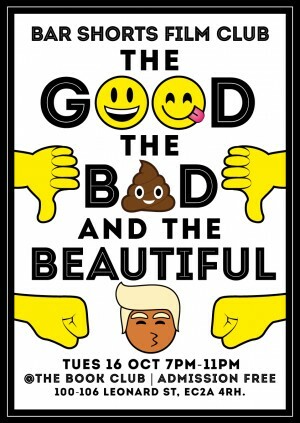 Bar Shorts Film Club is back exploring the Good, the Bad and the 'Beautiful' in an age of insanities. We've got films from Chris Shepherd, The Brothers McLeod, Steve Roberts, ScaryJacks, Jenny Jokela, Johnny Kelly and many more. The evening as usual is hosted by Chris Shepherd and Dog &Rabbit. Admission free. 7pm -11pm. Films start at 8pm.